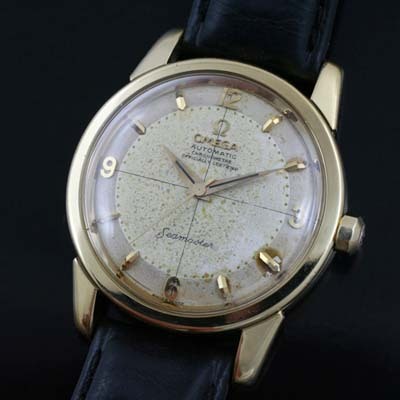 Rare vintage Omega Seamaster Chronometer is gold case. 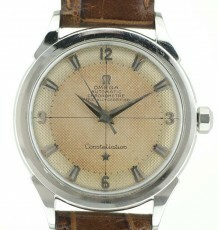 Original aged 2 tone dial with dauphine hands. 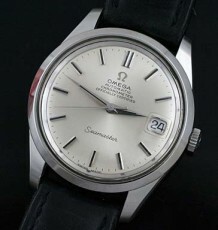 An all-original Omega Seamaster bumper automatic Chronometer. This vintage Omega classic watch is made more rare by the fact that it is cased in a Swiss 18 karat gold case with beefy lugs. 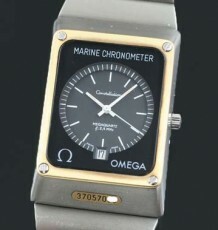 The dial on the watch is the original 2-tone pattern with applied gold markers. Arabic markers at the 3, 6, 9 and 12 o’clock positions, commonly referred to as the Explorer style. The watch is also fitted with gold dauphine hands. The dial does have some patina on it which adds to its vintage charm. I have elected to keep this all original as these Seamaster Chronometers are quite rare and collectors will appreciate the originality of the piece. The 17 jewel Chronometer grade calibre 354 movement was just serviced by my watchmaker and is keeping excellent time. 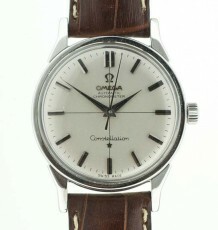 This watch dates to 1955 and was produced alongside the first series of Omega Constellations which also used the same movement. The case reference 2767/2770SC measures 34 mm wide by 41 mm long and can be supplied on either a black or brown leather strap.